As the best replacement of missing teeth, Implant Dentistry is an advanced way for keeping your bones, gums, teeth and overall oral health in great condition. Dental Advances have made it possible to not only replace the visible part or a missing tooth for aesthetic enhancement, but also replace the tooth’s root for better function and longevity. 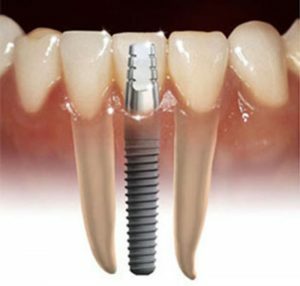 Dental Implants are titanium screws surgically placed in the jawbone in place of the missing tooth to act as an artificial root. Over time, excess bone and gum tissue grow around the implant, holding it firmly in place. After the implant is successfully solid in place, a crown, bridge or denture (artificial teeth) can be anchored to this root. The end result is a strong, durable and secure tooth that is virtually indistinguishable from natural teeth. Dr. Ricky Leung will determine whether you’re a good candidate for dental implants or not, after a thorough assessment of your jaw structure, bone and gum tissue. It is essential to make sure that you have healthy tissues for the success of the dental implant procedure. If not, Dr. Leung will provide you with alternative treatment plans that are more suitable for your case and oral health condition.